Discussion in 'Amps and Cabs' started by 60HzShuffle, May 25, 2008. So what are some of these mystery amps that are really cool if upgraded or given maintenance that are really nice to play around the house. I've seen that LeonC has a few magnatone's that I have never heard of, so I wondered what other small combo's are out there to scour eBay for. thanks for the suggestions. I'm thinking about something with a 6v6 or 2 and 10" or 12" speaker. Traynor 60's and early 70's tube amps and cabinets. These early Traynor's are becoming collectable. A local shop (Richmond, Va.) has a 1964 PANaramic (Magnatone, I think). two 6V6, one 12", reverb, pitch shifting tremolo. Clean with the wooden footswitch. $399. Some of the Alamo's sound great. I had a 1x12 combo called a Montclaire that had 2 6v6's and reverb and trem. 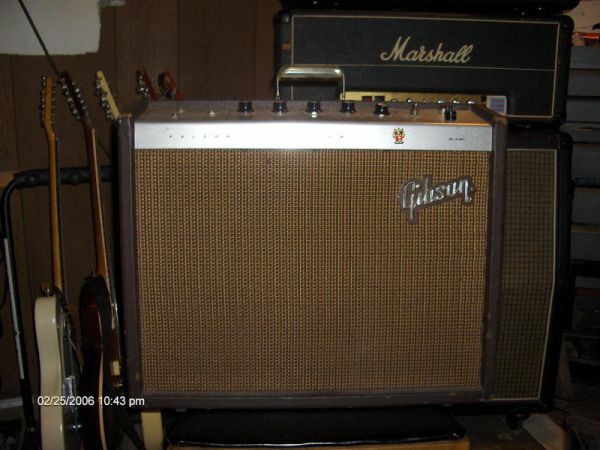 I have a '68 Standel S80v piggyback combo with a 1x12" cabinet (detuned and ported, pretty advanced for its day). The original 50s combos are worth megabucks, but this was probably made just before Standel went to solid state stuff. In addition, it uses 6DQ6 output tubes, which are relatively common radio/television tubes, but not common at all in guitar amplifiers. For that reason alone, this amp will probably never be a collectible, but it is a cool old amp. Champs, vibro champs or Broncos. I'm astounded at the tones I can get from my little Bronco. Put TS in front and you're good to go (around the house) If you have a reverb pedal that makes it all the better. The last Bronco (exactly the same as the blackface vibro champs) I saw on ebay went for $275. Get one, you won't regret it. I played through a Maestro with either 1x10" or 1x12" speaker that sounded gorgeous. There are dual 6V6 Silvertones. Also Gibson Falcon (GA19RVT). They may actually fall into the "collectible" category (I'm sure someone collects them! ), but reasonable price. There are so many, just under the radar screen. I share Leon's passion for magnatones, and others too. He has a 50's ampeg (M12 Mercury) which I think is one of the great, overlooked 2x6v6 amps from the tweed era. The M15 ampeg is 6L6, but another very nice sounding, not huge or overly loud amp. Ampegs in general are undervalued, big bang for the buck tonally. Older silvertones, danos and valcos too. If you can find one of the 50s silvertones, like the 1333, 0r 1432 (I think it's basically the same amp, 2 6v6 and 1x12), you might be amazed. Cheapo construction, high-end tone. Harmony, airline, gretsch ... all kinds of stuff in the valco camp. People are throwing big bucks at certain supro amps, while other brands might have essentially the same models, at much less money. 60's epiphone tube amps. ugly stepsisters to the gibson equivalents, but same schematics with usually one "downgrade" like a 8 inch speaker instead of a 10 inch speaker, or a 10 instead of a 12. i dont know anyone bothering to collect them, but they sound just as nice as the gibbies and are PTP handwired USA tube amps too! When I got my Falcon around 1992, I paid too much at $110. We'll get the members of the Falcon Owners Club together and you can be a FOCer too. virtually all those 60's "american garage" amps. Supro/valco, magnatone, silvertone, gibson, ampeg. To me the tweed sound has almost become generic, and these provide a little different tone that is equally cool. They have their own vibe, looks and tone wise with their smoky midrange and swampy looks.